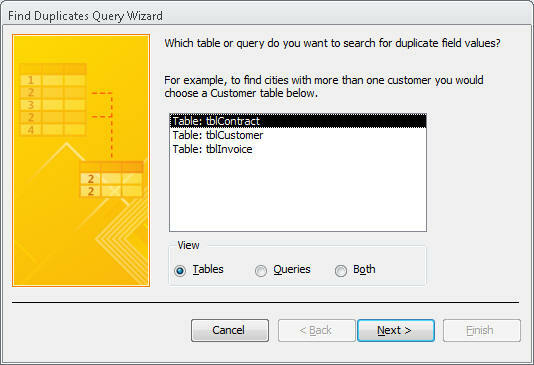 Creating Advanced Queries and Enhancing Table Design. 6. 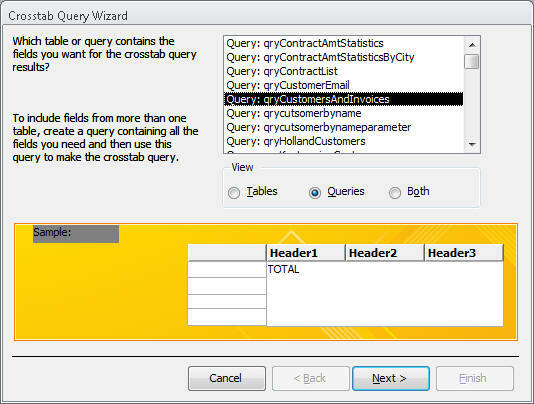 Use query wizards tocreate a crosstab query, a find duplicates query, and a find unmatched query. a. 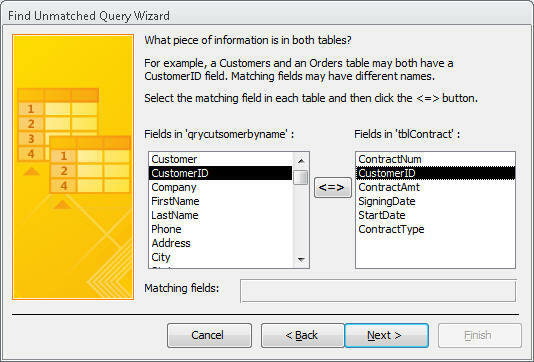 A pattern match select records with a value for the designated field tht matchces the pattern of a simple condition value. b. 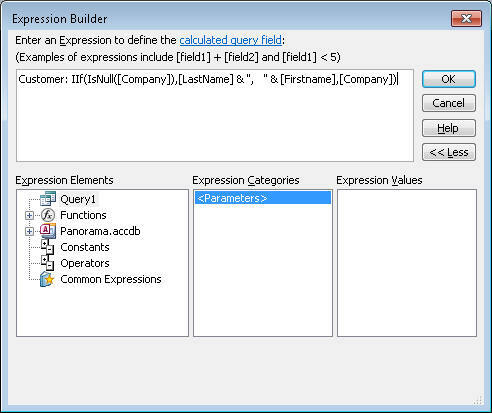 The like comparison operator. 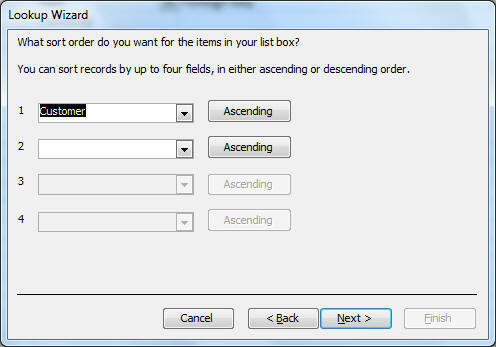 selects records by matching field values to a specific pattern tht includes one or more of the wild card cahracters.
? - represents a single character. 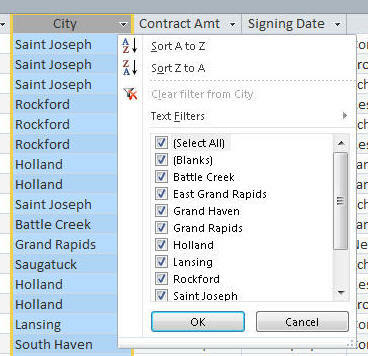 like"616*" in the phone field retirives all records beginning with the area code of 616. 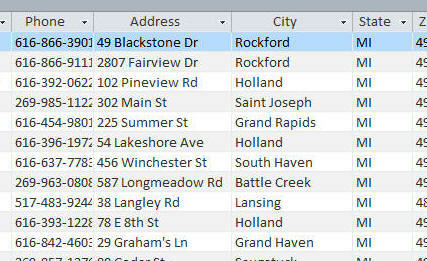 In("Holland","Rockford","Saugatuck") in the city field retrives all records from Holland, Rockford, Saugatuck. 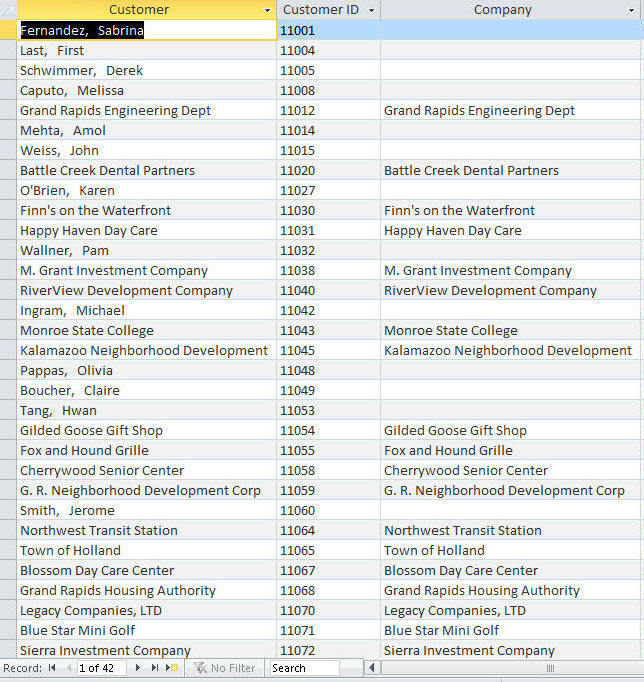 Not In( "Holland","Rockford","Saugatuck") in the city field retrives all records but Holland, Rockford, Saugatuck. 4. 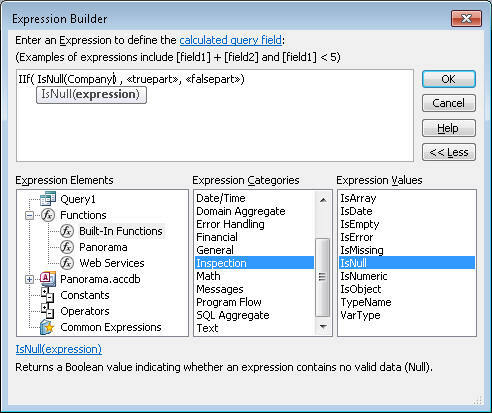 Using the Iif function. 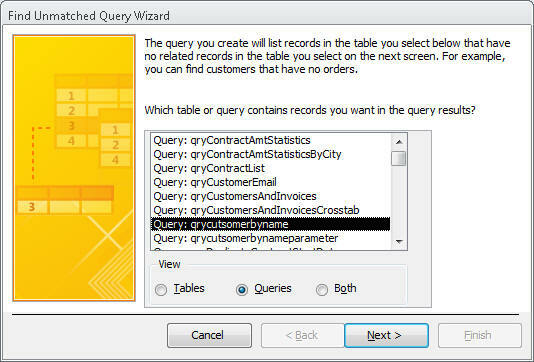 Click create tab, click Query Design, click tblcustomer, click add, click close and drag all fields onto the query grid into the second column. 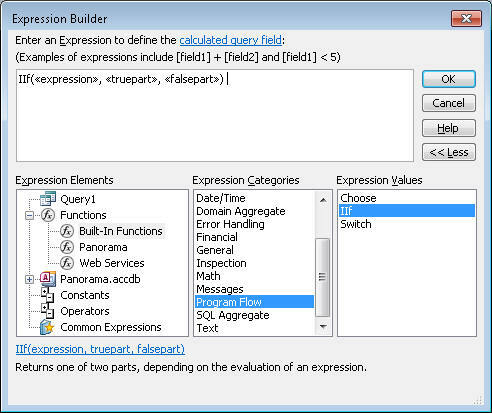 The first will be used for the calcualted field using the iif function. b. 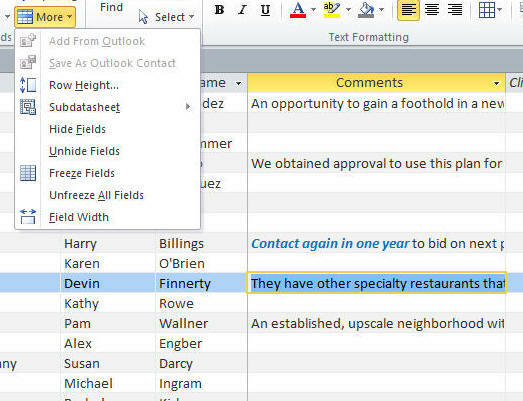 In the box type Customer: and press the space bar - make sure the colon is there. 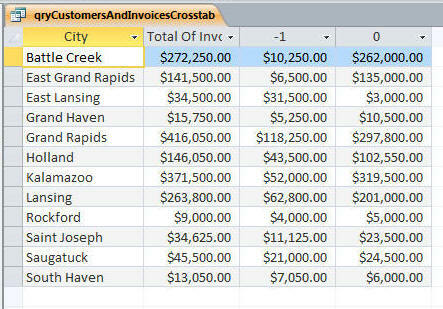 d. Click <<Expr>> and press the Delete key to get rid of first place holder. i. 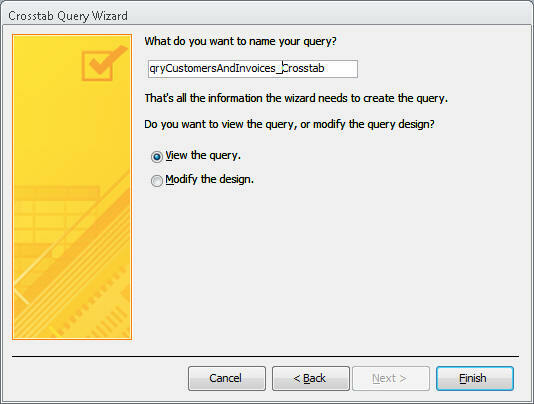 Save the query as qryCustomkersByName. 5. 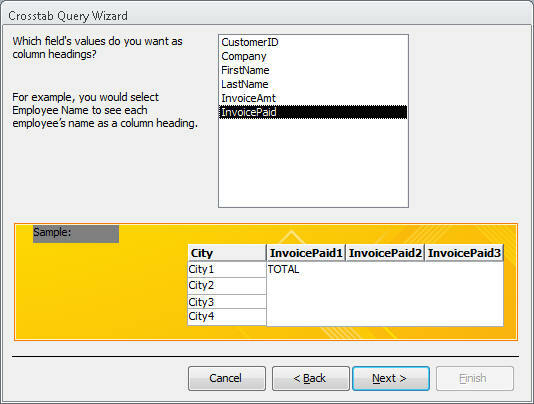 Create a parameter Query - dispalys a dialog box that prompts the user to enter one or more cireterial values. 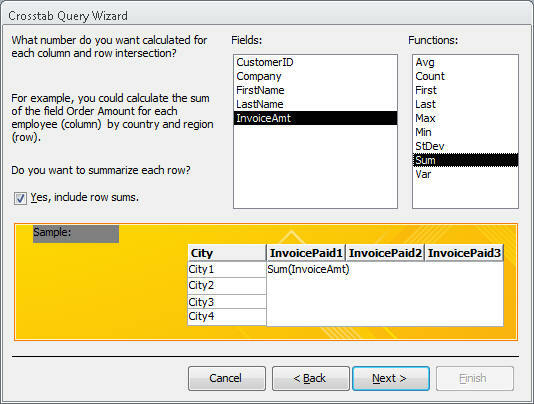 d. Modify the parameter query: Switch to design view. 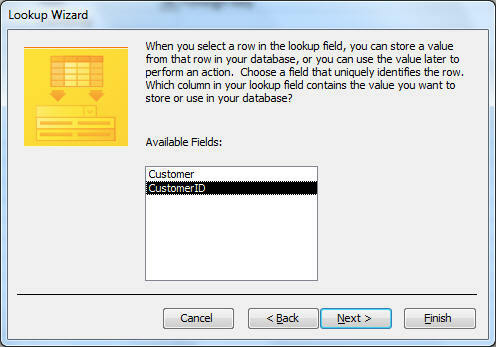 f. All the records with a city field beginning with S are selected. 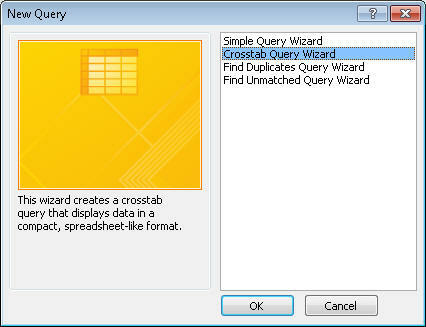 a. Crosstab queries displays only one summarized record for each unique field value. b. 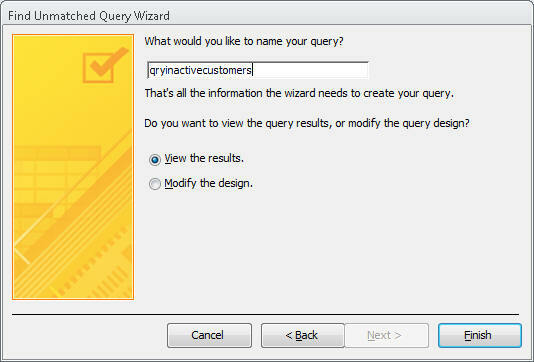 Close but do not save the query. 8. 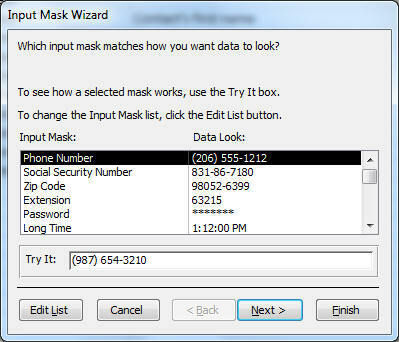 Creating a lookup field., input mask, and data validation -a lookup field lets the user select a value from a list of values. 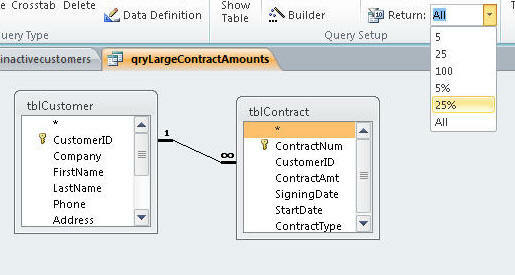 Insures some data intergity. 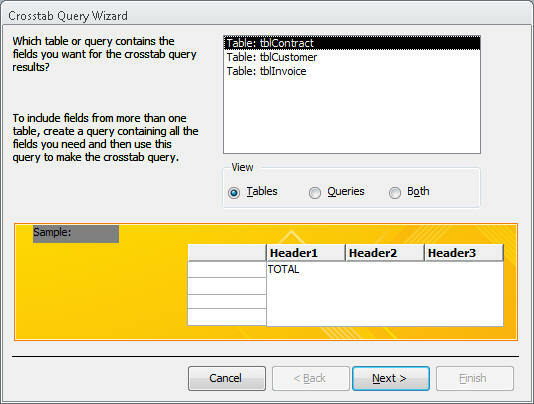 b. click ok, close the table,open the relationship window and delete the join between tblcustomer and tblcontract by right clicking the join line, click delete, click yes. and close the relationship window. 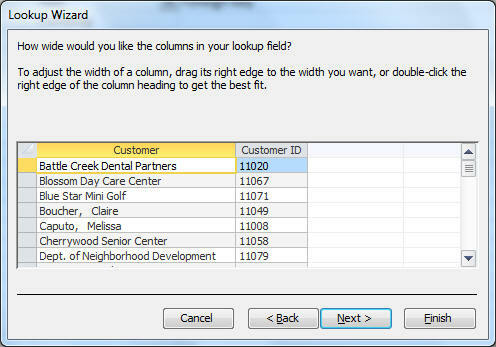 h. click between the column heading to adjust the with to accomidae the entire field. 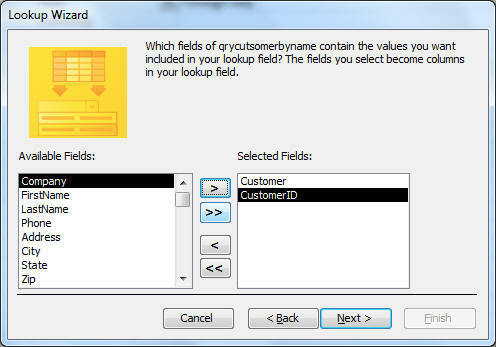 You will have to scrool down to adjust all of the fields. 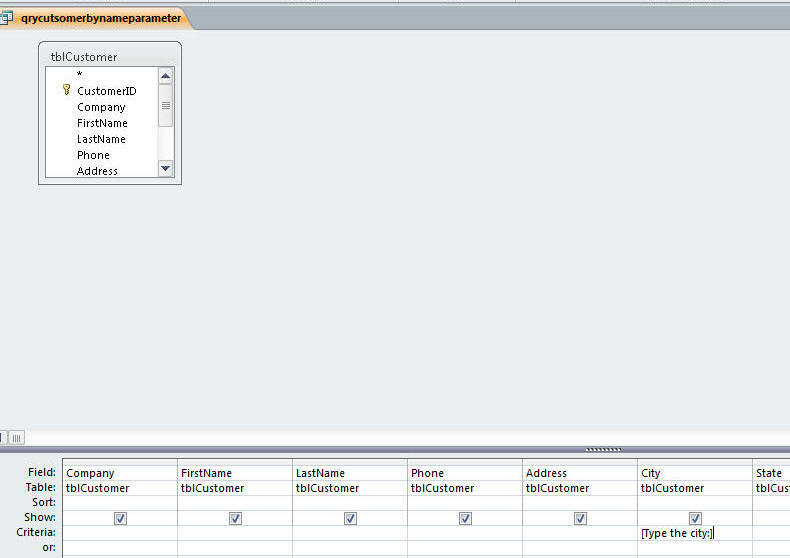 j. accept the default customerId and click finish. 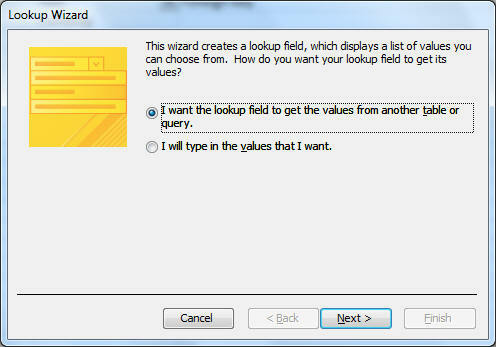 Which will return to disign view. 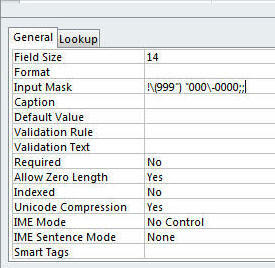 k. save the table and go to datasheet view. j. 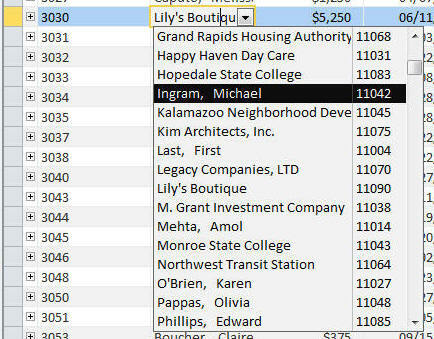 Select Ingram, Michael, save and close the table.
" Enclosed characters treated as literal display characters.
! 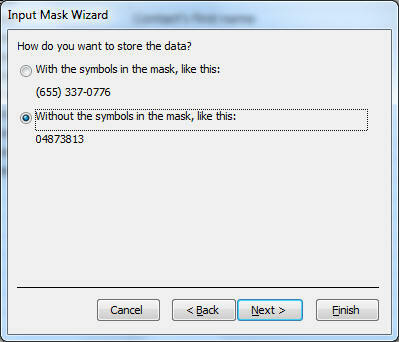 Input maske is displayed fromrightto left, riather thtn the fefault of left toright. ;; The character between the first and second simicolon determines wheater to stroein the databasethe literal dispaly characters. 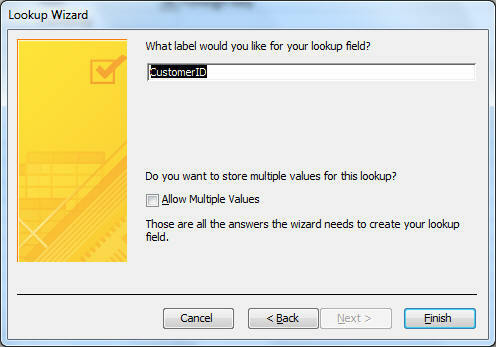 bliank or 1 do not store, 0 store the literal dispaly characters. 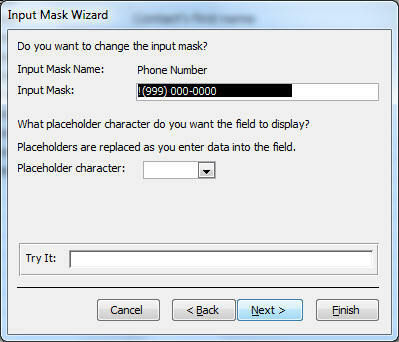 e. Change the input mask to 999\-000\-0000;;_ and press tab. click the property update options and click update input mask everwerer phone is used. 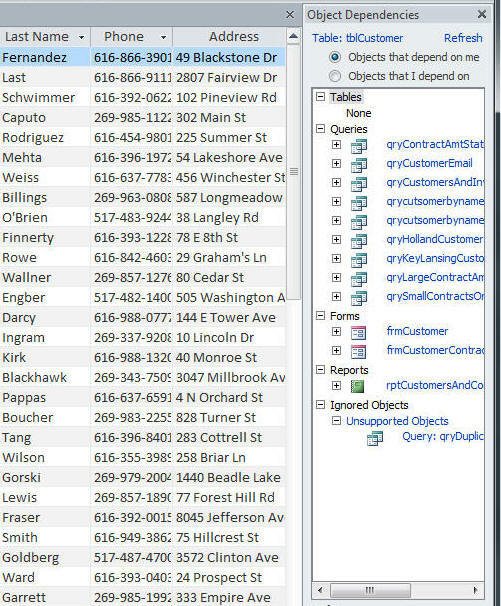 b. here you see a list of the object dependencies. 10. 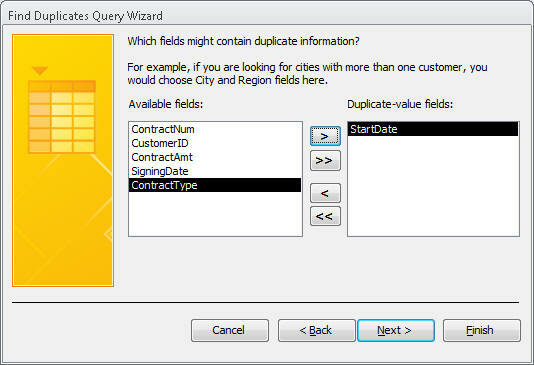 Data validation rules. 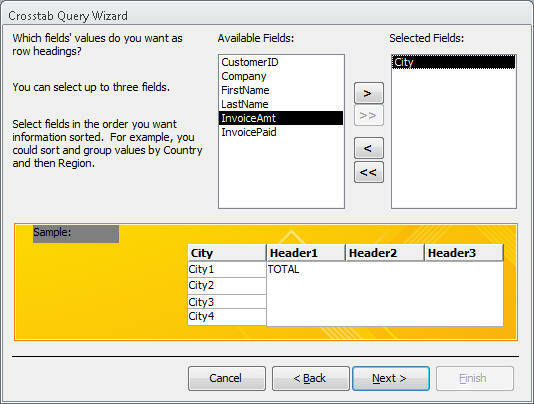 verifies a field value by comparing it to a constant or a set of constants. 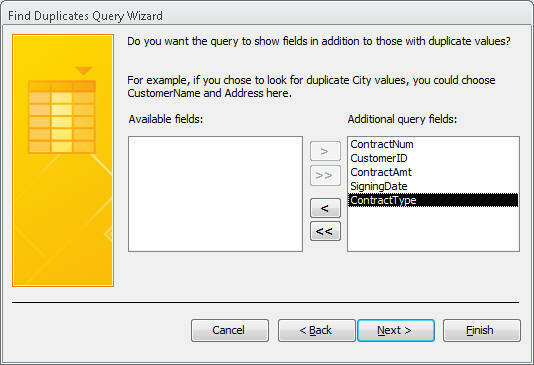 Validation Rule specifies the valid values. Validation Text specifice a message that informs the user of their error. 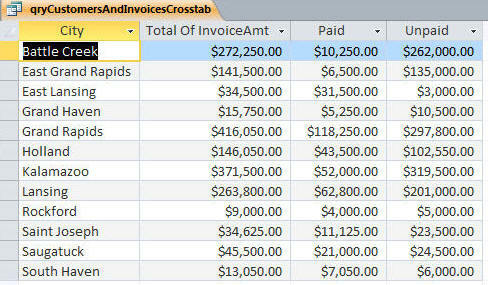 Open the tblinvoice in design view and click the invoice amt field. 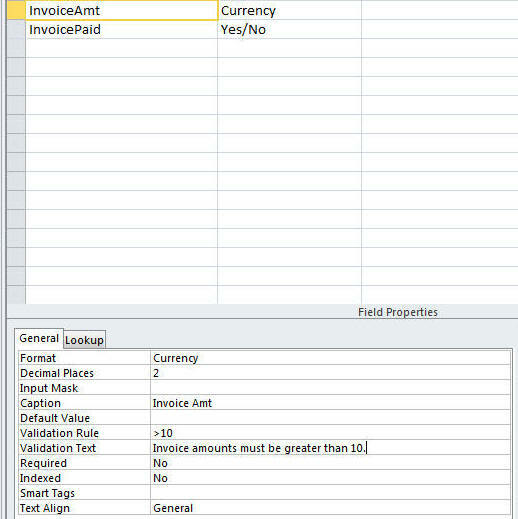 In the validation Rule type >10 and in validation text box type Invoiceamounts must be greater than 10. 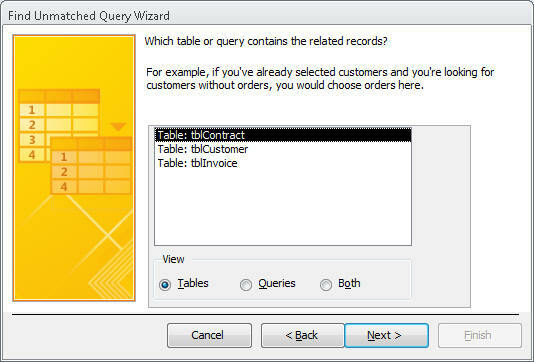 You will see:"
c. click ok, hit esc to return to orginal value and close the tblinvoice. a. scroll to comments box for the first record and click in it. Hold down the shift key and press f2 and release the shift key. 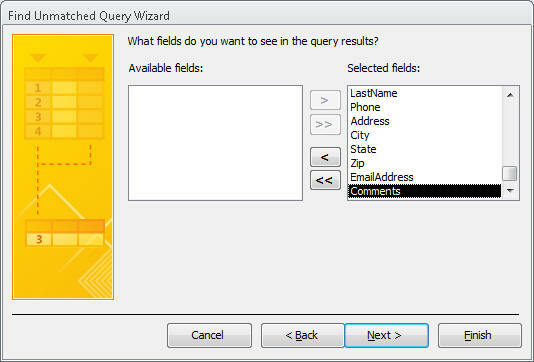 YOu will see the zoom box and all of the text in the comment field. b. 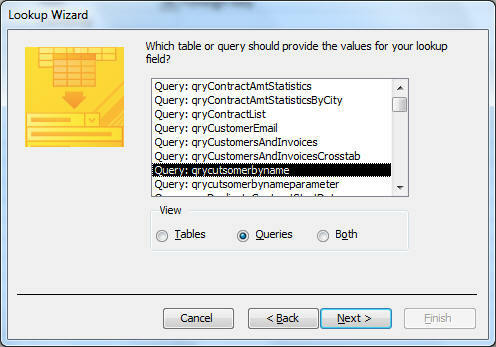 Save the table , switch to design view, click the comments field name, click text format box, click it arrow and sse ritch text format. 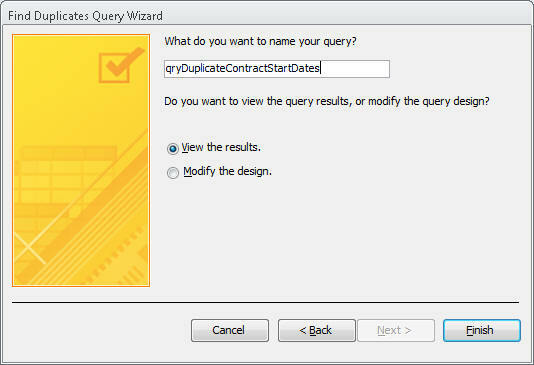 Click the append only box. 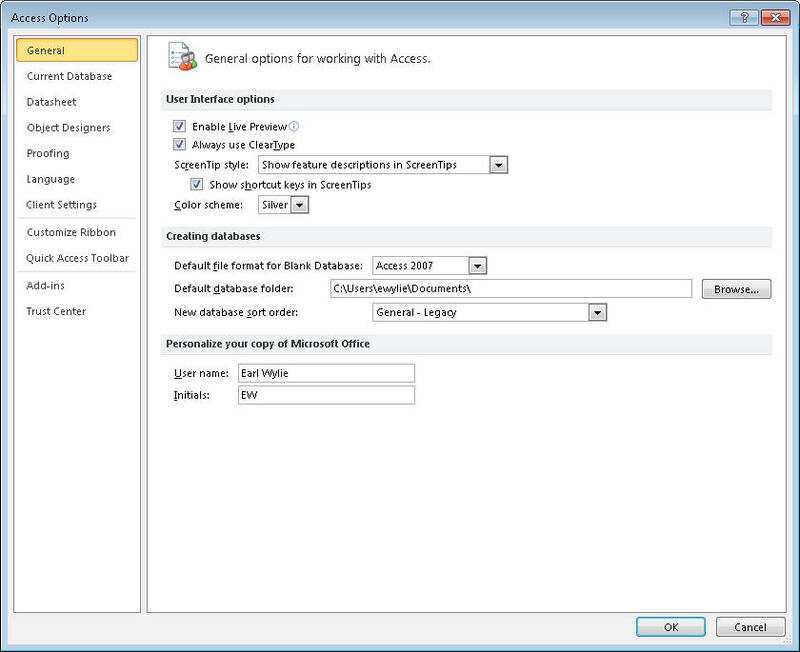 If you select yes, access will keep track of all of the revisions you make to the memo field. 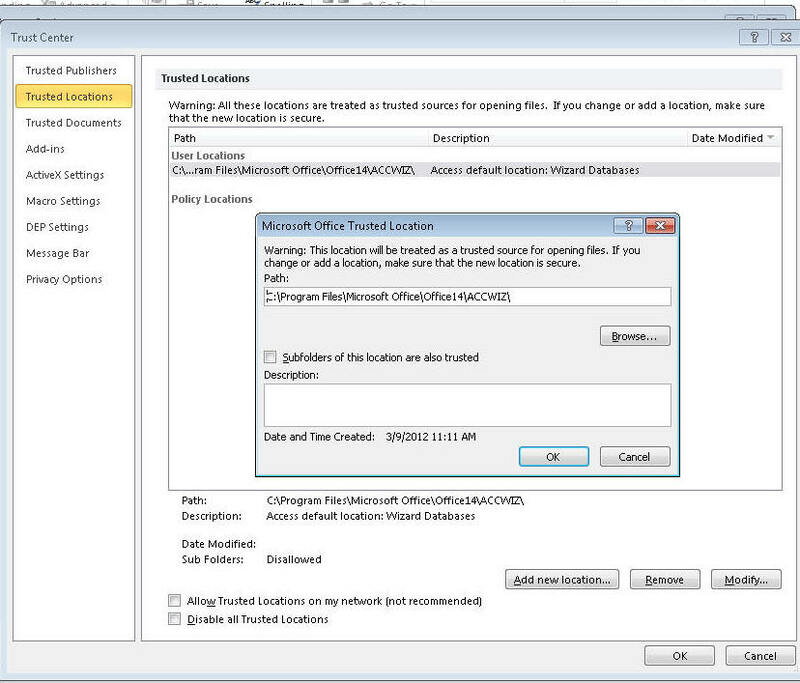 b. Browse to the folder you want to trust and click ok, click ok. click 0k.